This week, the Kansas City Star released a three-part series on the beef industry after a year-long investigation. 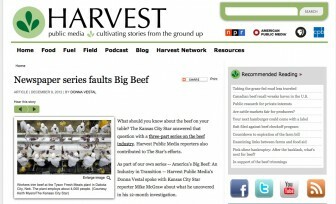 Harvest Public Media contributed to the project and produced several radio stories on the topic, including an interview with project reporter Mike McGraw. 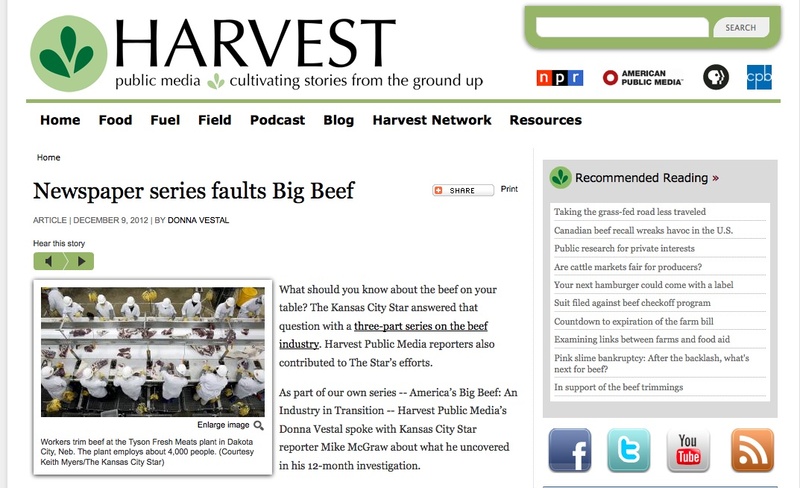 "What should you know about the beef on your plate? After a 12-month investigation, The Kansas City Star answers that question with a three-part series on the beef industry." "Abraham Lincoln established the land-grant colleges 150 years ago as the “peoples’ universities” – places where research could be done to help the common man. But times have changed and public colleges in the top five beef-producing states are now increasingly working for big business." "For centuries, ranchers have made cattle-mating decisions based on the outward appearance of animals. But times have changed thanks to an emerging understanding of cattle genetics."